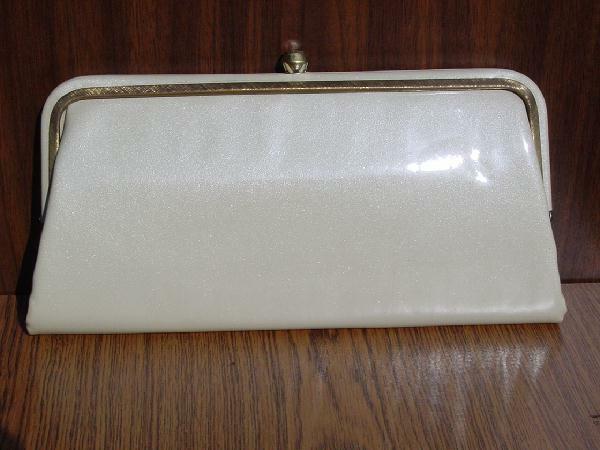 This vintage '50s bone with a hint of beige clutch has an antique gold-tone front trim. It has a single top ball closure and the interior is lined in a peachy beige fabric. There is an interior open pocket. There are a few lipstick marks in the bottom of the lining. The gold-tone finish is missing in some areas of the top closure and there is a mark the size of a pinhole on the top of the rim near the closure. A former New York model carried this purse in a photo shoot for her portfolio. She liked it so much she bought it. When she moved to California, it went with her to several Hollywood movie premieres and parties. If this purse could only talk.